Feline declawing is an elective and ethically controversial procedure, which is NOT medically necessary for cats in most instances. Declawing entails the amputation of a cat’s third phalanx [P3], or third ‘toe bone.’ Unlike human nails, cats’ claws are attached to the last bone in their toes. A comparison in human terms would be cutting off a person’s finger at the last joint of each finger. The American Association of Feline Practitioners strongly opposes declawing as an elective procedure. 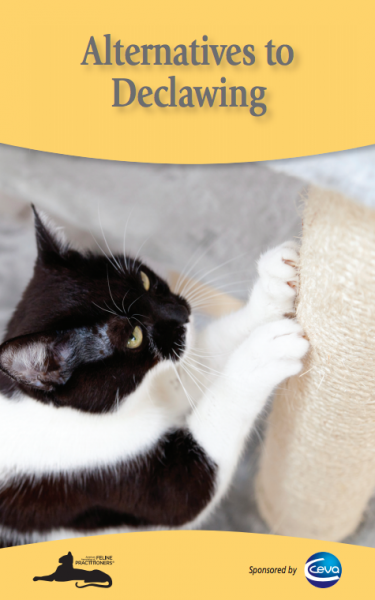 It is important to understand that scratching is normal behavior for cats, which has an inherent function. The primary reason cats scratch is to maintain the necessary claw motion used in hunting and climbing, as well as a means to stretch their body. Scratching serves to groom the front claws and leave markers of the cat’s presence. A cat’s claws grow in layers and scratching removes the worn outer layer to expose the new growth inside. Cat owners must therefore provide alternatives for cats such as suitable scratchers.